I’m joining in with Cathy at Rambling in the Garden for her ‘In a Vase on a Monday’. I’ve been admiring other bloggers’ vases for a few months now and decided it was time to have a go myself. Now, I’m definitely of the ‘pick and plonk’ school of flower arranging, so it’s a rather free-form offering of Hesperantha (unknown variety bought at a plant sale earlier this year), Gaura ‘The Bride’ (definitely going over), a few bronze fennel fronds and a couple of spikes of what I think is a form of Lysimachia ephemerum (but I could be wrong!). Please excuse the grubby table – I only noticed the marks after I’d uploaded the photo! Do go over to Cathy’s blog to see her vase and the links to many other lovely arrangements to cheer your Monday morning. Welcome aboard! I love the airy free feel to your arrangement which goes so well with the colours or its setting. Pretty flowers and foliage, a timeless vase and a solid, honest table! Perfect. Love the grey greens, they work beautifully with the coral and white, and also against the background. I love the Hesperantha, Sam, as well as the loose arrangement of plants and flowers. Oh it is nice to see you here Sam. It is a lovely almost willowy vase and I agree with Wild Daffodil that it looks just right in your kitchen. I often wonder if vases resemble their owners? Free-flowing and lovely, the colors remind me of Christmas! Thank you Eliza – a bit early for Christmas but thanks! Thanks Sarah. There are lots of lovely vases on a Monday via Cathy’s blog. Welcome to In a Vase on Monday, Sam. I am only on my third, I think the majority of us are of the plonking style. Thank you Brian. I’m sure it’s going to get harder to produce arrangements as the season progresses but I guess that’s part of the fun. Nice arrangement, plus I like the little glimpse of your kitchen. So you are willowy are you? My last vase was autumnal, oh dear. 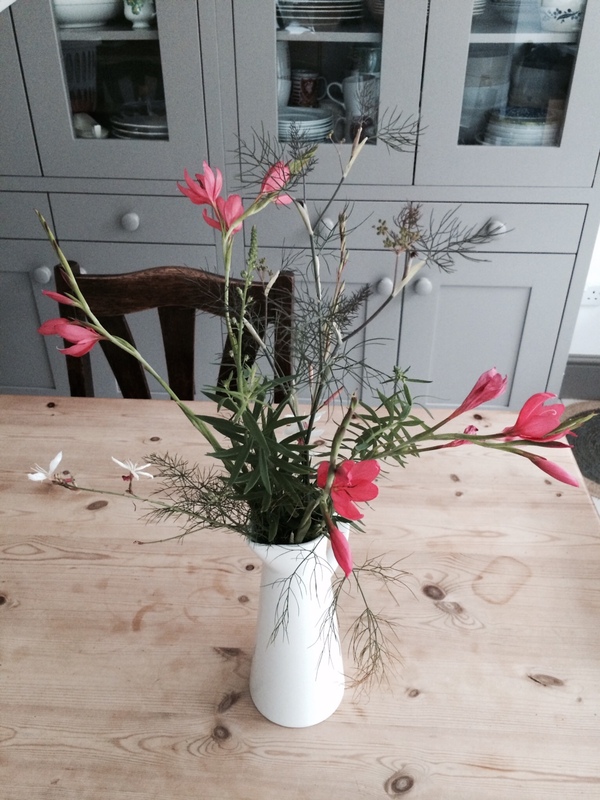 I love Hesperantha and I never thought of cutting it for a vase, it looks so pretty. I love your vase Sam, it is delightfully fresh and summery. By the way, aren’ t you glad we don’ t have to call it Schizostylus any more? I could never remember how to spell it. Oh, on the inside! I’ m willowy on the inside. But my outside rather let’s me down. Hi Sam, nice to meet you. I like the Hesperantha in a vase, and also have a white/pale pink Gaura that I have as yet not dared to cur for a vase. I am certainly not as adventurous as you! It’s very pretty. I love the flowers you chose, the vase and the table, all of it. Just lovely and great for a first attempt! I hope you’re having a good week so far. Thanks very much Jennifer. It’s been a lovely day here today, so I’ve been catching up with jobs in the garden (lots of weeding and clearing badger poo – nice!). Hope your week is going well. Welcome to Cathy’s meme…..I became addicted once I started, and love just picking and plonking….I have learned so much from the bloggers who are part of this wonderful meme. Love your first vase….lots of wonderful foliage to go with your blooms. Thank you Donna. I’m not sure I’ll manage it every week but I’ll certainly have another go as it is lovely to bring some of the garden indoors.